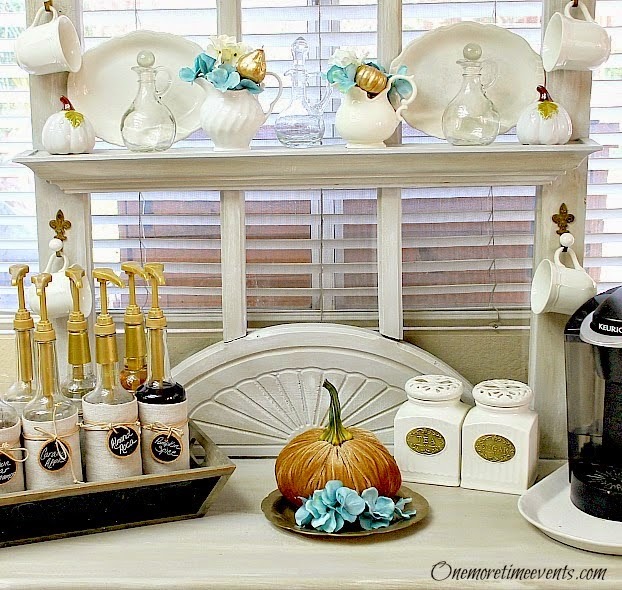 I’m so excited to be able to introduce you to another one of my friends who is contributing to All Things Heart and Home this fall and holiday season! I met Tammy from One More Time Events when she started linking up with Twirl and Take a Bow (the link-up that I co host!) I was so impressed with her eye for design …this girl can put together a buffet or a table like no one else! 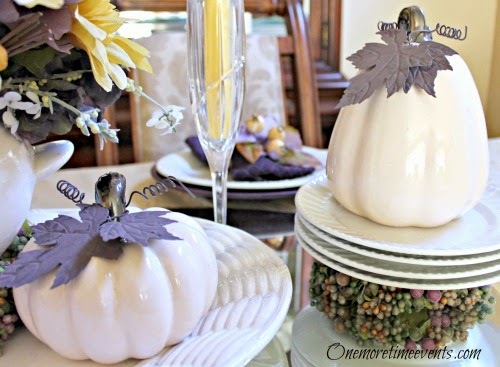 Today, she’s going to show us a Quick and Easy Fall Tablescape on a Budget ! 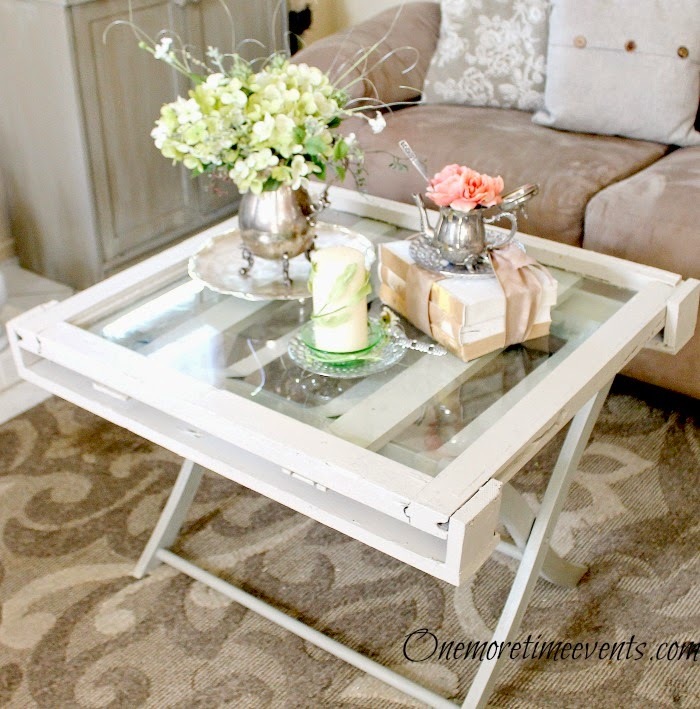 Hi, I’m Tammy from One More Time Events where I enjoy the challenge of renovating my home décor, while trying to figure out how to make something out of ‘nothing’ and enjoying every step of the challenge to share and hopefully inspire all of you. 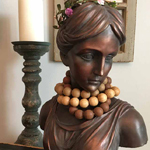 I’m so happy to be here with my first contributor post and can’t wait to share more with you all in the next couple of months here at All Things Heart and Home. I have been a follower of All Things Heart and Home for some time now and those of you that do know and follow Robin, already know why we do! 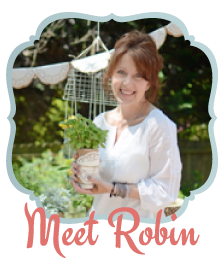 Robin has to be the sweetest person I have met (virtually) and the name of her blog reflects just what she is all about. 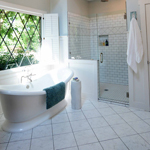 While creating a beautiful home with a beautiful heart = All Things Heart and Home! Today I would like to share with you how I decorated for Fall using what I have, a few thrift store finds along with a few purchased items. I hope you enjoy it as much as I did putting it all together for you all. 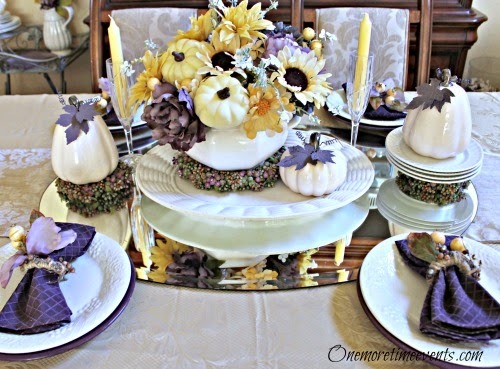 When Robin introduced me as one of her contributors, she shared a picture of my Fall buffet decorated for Fall using lighter shades vs your traditional colors. 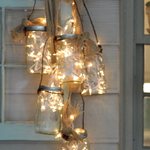 To me Fall is a warm soft cozy feeling and I wanted to reflect that in my Fall Decorations to welcome everyone. 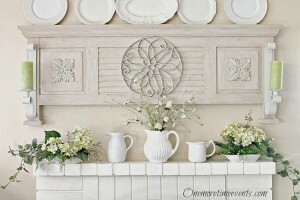 I carried that same feel into the dining room when I decorated the dining room table. 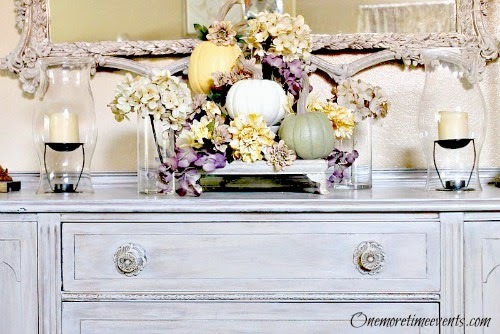 Everything in the above picture, other than the 3 pumpkins with purple leaves and a few faux florals, are pieces I have collected over the years from thrift stores. When decorating my table for Fall it makes me think, harvest collected in weaved baskets, and a nice big warm bowl of soup. 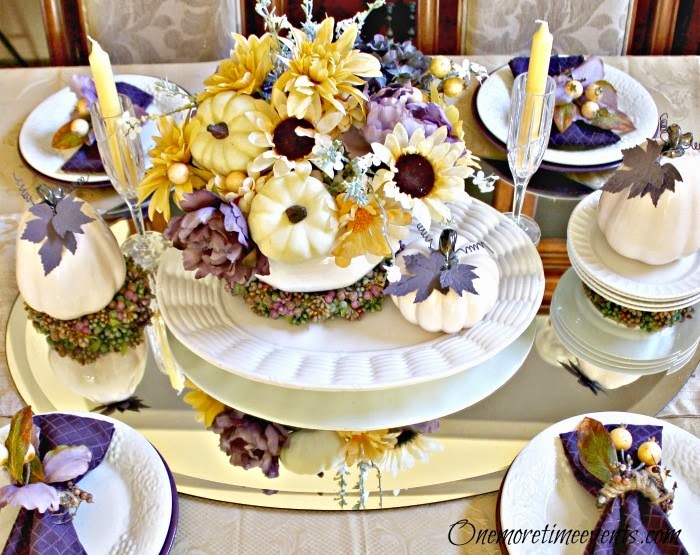 Going with that Fall feeling a soup terrain was used to make a Fall floral arrangement and placed on a harvest colored candle ring. 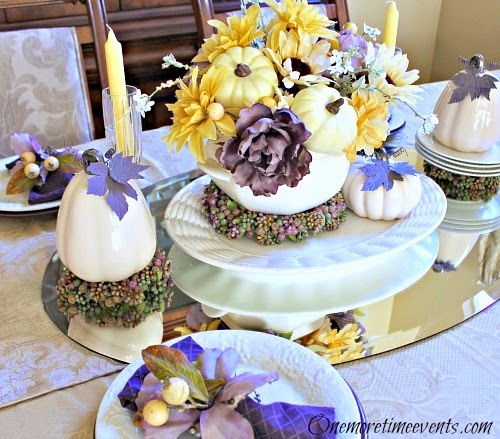 The centerpiece was then placed on the large white basket platter along with a ceramic pumpkin. A couple of crystal champaign glass (to celebrate Fall…Cheers!) was used to hold some yellow candlesticks. 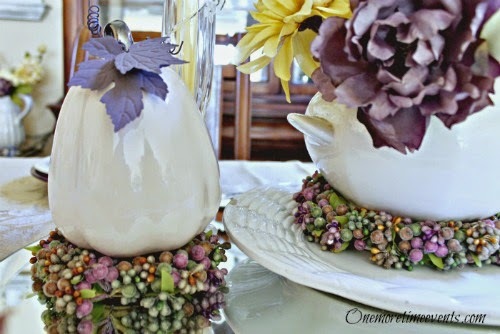 For my napkin rings I used some that I made a while back out of shower rings and added some Fall floral pics and leaves along with part of a floral flower wrapped around a purple napkin. 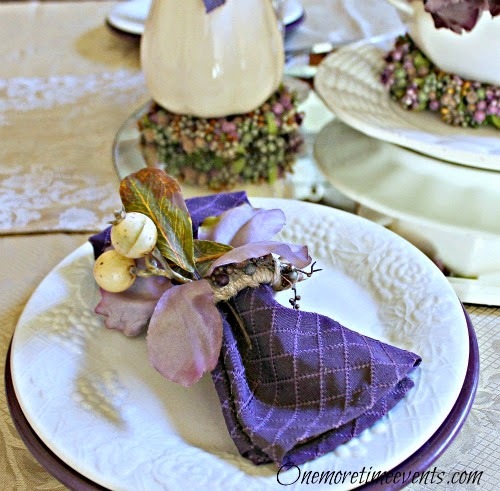 I used a slightly larger purple plate as a charger and to pull the colors of purple and placers a white embossed floral and grape plate on top. 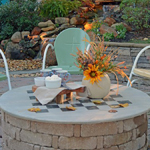 When decorating for Fall …it doesn’t have to be expensive to create a beautiful setting! Thank you so much Robin for having me, I can’t wait to come back next month to bring you all some more Fall goodness. Thanks so much my friends- when you get a minute visit Tammy and tell her I sent ya! 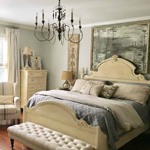 « Fall Nesting and Twirl and Take a Bow!